Some of your favorite film characters were, at one point, on the chopping block. During development, screenwriter Lawrence Kasdan seriously considered killing off Han Solo in the middle of Return of the Jedi to raise its stakes. But George Lucas wasn't a fan of the idea: Han Solo's death would have cut into toy sales, so the character remained alive. While Dr. Ian Malcolm, played by Jeff Goldblum, survived the dinosaur attack in Jurassic Park, he actually dies at the end of the novel on which it's based. Since Steven Spielberg cast the very charismatic and likeable Jeff Goldblum to play Malcolm, co-screenwriter Michael Crichton let the character survive. Malcolm is also the central character in the sequel novel, The Lost World. Crichton wrote that the character survived the Tyrannosaur attack because of skillful Costa Rican surgeons; Malcolm even boasts reports of his death were "greatly exaggerated." As a result of the attack, the character had a permanent leg injury that required him to walk with a cane. In the original Scream screenplay, Deputy Sheriff Dewey Riley dies after being stabbed. But after director Wes Craven cast David Arquette in the role, the character became younger and more likeable. Craven felt that the audience wouldn't like seeing the character die in a horrific way, so he shot two versions of the ending—one with Dewey's death and another without it. Test audiences didn't react favorably to Dewey's death, so Craven let him live—and Deputy Dewey returned for the three Scream sequels. In the novel First Blood, Rambo commits suicide at the end of a long battle with Sheriff Teasle. Rambo's death scene was filmed, but Sylvester Stallone saw the potential for a new franchise, so Rambo lived to fight another day in the final version. Rocky V was supposed to be the last movie in the franchise, and Stallone ended its screenplay accordingly, with Rocky Balboa dying at the hands of rival Tommy Gunn during a street fight. But during production, director John Avildsen got a call from executives telling him, "'Oh by the way, Rocky’s not going to die,'" he recalled in 2014. "'Batman doesn’t die, Superman, James Bond, these people don’t die." Stallone wrote a new ending featuring Rocky and his son Robert Balboa jogging to the Philadelphia Museum of Art and looking over the city's skyline. Before Paramount Pictures acquired the film rights to Paranormal Activity, its original ending featured the police discovering Micah's dead body in the house, while a catatonic (and possessed) Katie sat with the knife she used to kill her boyfriend. The police tried to get her to drop the knife, but sudden movements provoked the cops to shoot her dead instead. Paramount didn't like the original ending, so two endings were developed and filmed. The first featured Katie surviving the night, while her whereabouts remained unknown, and a second ending featured Katie slitting her throat with the knife that killed Micah. Paramount Pictures eventually used the former for the final version of Paranormal Activity. In the original ending of Kevin Smith's debut film Clerks, the convenience store gets robbed, and clerk Dante Hicks is murdered. But after the movie screened for the first time at the Independent Feature Film Market, Smith's colleagues Bob Hawk and John Pierson advised him to end the film happily instead. Smith agreed, and now Clerks ends with Randall taking down Dante's "I Assure You We're Open" sign and telling him, "You're closed!" as the movie fades to black. In the original Rise of the Planet of the Apes screenplay, Dr. Will Rodman (played by James Franco) was supposed to die in Caesar's arms just before the ape heads into Muir Woods at the end of the movie. Director Rupert Wyatt even shot the death scene, but it was scrapped for a new ending that was more bittersweet. Despite the changes, Franco didn't return to the sequel Dawn of the Planet of the Apes—but his character makes a very brief cameo and is presumed to have died of the Simian Flu. 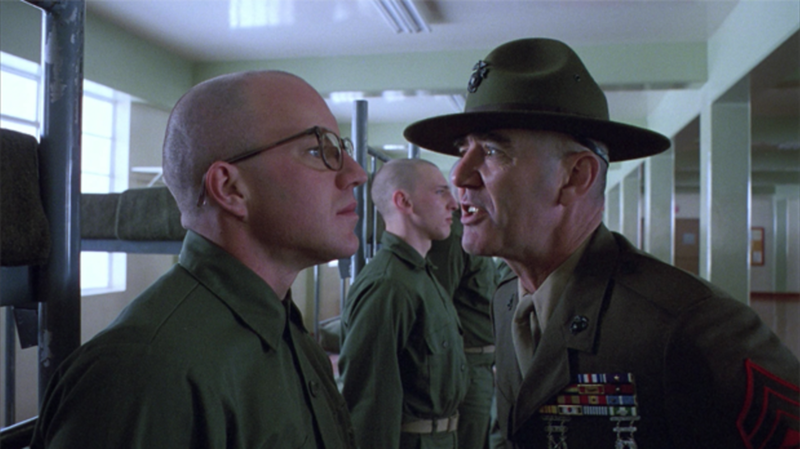 Actor Matthew Modine, who plays Sergeant James T. "Joker" Davis in Full Metal Jacket, revealed that Stanley Kubrick originally planned to kill off his character (who also dies in the book). According to Modine [PDF], "We never filmed it, but that was always the intention in the script, in the story: it was that Joker would die." Iron Man 3 storyboards revealed that Stark Industries' Head of Security, Happy Hogan (played by Jon Favreau), was supposed to die during a hand-to-hand fistfight with one of the villain's henchmen at TCL Chinese Theatre in Hollywood, California. In the final version, Happy slips into a coma and awakens at the end of the movie. Although Reservoir Dogs was Quentin Tarantino's first film, True Romance was his first major motion picture screenplay. Tarantino gave Tony Scott the scripts for both Reservoir Dogs and True Romance, and when Scott expressed interest in directing both of them, Tarantino said, “You can only do one.” Scott picked True Romance. According to Tarantino's audio commentary, the final version of True Romance is pretty much the same as what's in the script—except its happy ending. In the movie, Clarence and Alabama (Christian Slater and Patricia Arquette) get away together with the money, but in the script, Clarence dies, and only Alabama gets away with the money. Scott changed the ending because he fell in love with the young couple and wanted to see them live happily ever after instead of separated. If Tarantino had directed True Romance, he would have kept to his screenplay and given the film a darker tone. He admitted to Maxim, "When I watched the movie, I realized that Tony was right. He always saw it as a fairy tale love story, and in that capacity it works magnificently. But in my world Clarence is dead and Alabama is on her own. If she ever shows up in another one of my scripts, Clarence will still be dead." Although Matt Hooper, played by Richard Dreyfuss, lives at the end of Jaws, the character had a different outcome in the novel of the same name from author Peter Benchley. When Hooper is lowered into the open waters in a shark cage, the giant great white eats him. The book character was very unlikeable, so the movie character was rewritten to suit Dreyfuss (who, initially, turned the part down). During the final shootout in Lethal Weapon 2, Arjen Rudd, the Minister of Affairs for the South African Consulate, is armed with diplomatic immunity, so he shoots LAPD Sergeant Martin Riggs, played by Mel Gibson, in the back. Screenwriter Shane Black originally planned to kill off the character, having him die in Sergeant Roger Murtaugh's (Danny Glover) arms. But the producers wanted to make more Lethal Weapon movies, so Riggs survived at the end. As a result, Black left the film series because of the changes to his screenplay. Science fiction historian David A. McIntee revealed in his book Beautiful Monsters that director Ridley Scott originally planned to kill off Ellen Ripley at the very end of Alien—by having the Xenomorph bite off Ripley's head. The alien would then have mimicked her voice to record one last entry in the Nostromo's log before the movie faded to black. The producers thought this ending was too dark for an already bleak movie, so they insisted that Ripley survive the ordeal and have the Xenomorph die at the end instead.